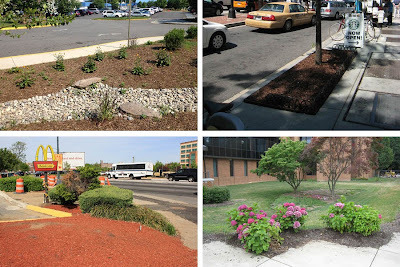 This native plant garden was planted 12 months before this photo was taken, with landscape plugs 8″-10″ apart. A native plant garden full of healthy, well-chosen plants is a joyous place: beautiful and full of wildlife. Too often, though, native plant gardens end up being something less than joyous. One the primary reasons that people are disappointed with their native plant gardens, even if they are not fully aware of the reason, is that they are under-planted. Using too few plants in your garden creates more work for the gardener, and a less friendly place for wildlife. If there is a gardening maxim to live by, this may be it. Bare soil does not typically persist in nature: in most wild plant communities, especially the native plant meadow communities that serve as the basis for many of our native plant garden, plants provide complete ground cover. Fill your garden with plants, not mulch. But unlike these native plant communities, gardeners often try to get away with a less dense plant spacing. Gardeners often make the mistake of following the advice on their perennial plant tags and putting 18” or even 24” between plants. There are few things you can do to undercut the ecological and wildlife value of using native plants that are worse than this. You end up with great expanses of mulched wasteland, with a few random pimples of plants in between. Landscape architect Thomas Rainer points out this is a dominantly American obsession. What’s the right plant spacing? As a rule of thumb, we recommend 1 plant per square foot. If you have a small garden area (under 350 square feet), you will probably be using quart or gallon-sized plants. We suggest spacing quarts 12” apart and gallons 14” apart. Either way, if you are buying your plants at one of our retail sales this means you should budget roughly $6 per square foot for plants. Landscape plugs must be special ordered, but are economical and highly effective. If you have a large garden area (over 350 square feet), we will probably recommend that you rely primarily on landscape plugs. Landscape plugs typically have root systems that are 2” wide by 5” deep. They are less expensive than retail quarts, are much easier to transport and transplant, and are typically planted with 8” to 10” spacing. Even with this increased density, your plant budget can be reduced to $3 or $4 per square foot. The downside of using landscape plugs is that we these are a special order item, so we ask you to place your order 3-4 months in advance if possible. Also, I should add that I am talking primarily about perennial flowers, grasses, ferns, and sedges. If you want to add shrubs and trees to your garden, you’d add those to your budget separately. Planting densely can help ensure there is less room for weeds to invade your garden. Tightly spacing your native plants allows the plants to cover the soil instead of relying on bark mulch to do that. Including some plants that spread by rhizomes or runners in your plant mix essentially lets the plants BE the mulch. This ground cover layer protects the soil and provides habitat for wildlife in the first growing season. This will reduce the amount of weeding you must perform later, and will help your plants to be more drought tolerant. Furthermore, by cutting out the step of reapplying bark mulch every year you are giving your garden a chance to self-perpetuate: you’ll be building up a seed bank of native plants in your soil so that if you DO have soil disturbance, your garden can heal itself. If you are interested in placing a native plant order with Herring Run Nursery for your project, we encourage you to email our nursery manager soon. Send your inquiries, orders, and questions to nursery@bluewaterbaltimore.org and we will get back to you soon.